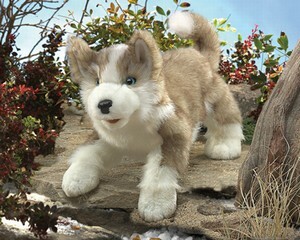 Folkmanis 2994 - More cuddly than fierce, this tawny brown and white Wolf Pup puppet is fresh from the den with fluffy, soft fur to keep both you and him warm this winter. His sweet expressive face features perky ears, brilliant blue eyes and a movable muzzle. Not the lone wolf type, this gregarious little guy will prey on you for lots of love to surely become a leader of your puppet pack. Movable muzzle and forepaws. Puppet measures 13” x 8” x 7”.